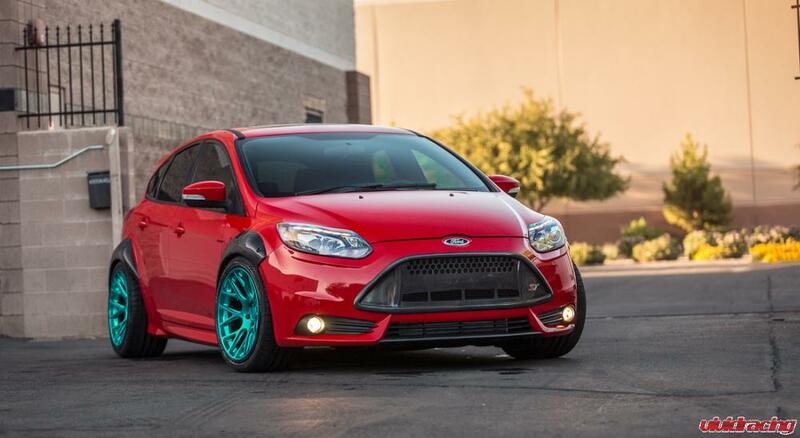 We have been working on this Ford Focus ST project car since January. From day 1, we wanted to create something with an aggressive stance, improved styling, and some giddy-up power. After blowing off all the dust from its long stint as a R&D mule in the shop, we gave her a bath and shine to take some initial photos of the Ford Focus ST. Now first we have to say that we have kept the carbon parts raw so people can see that they are “made from carbon”. 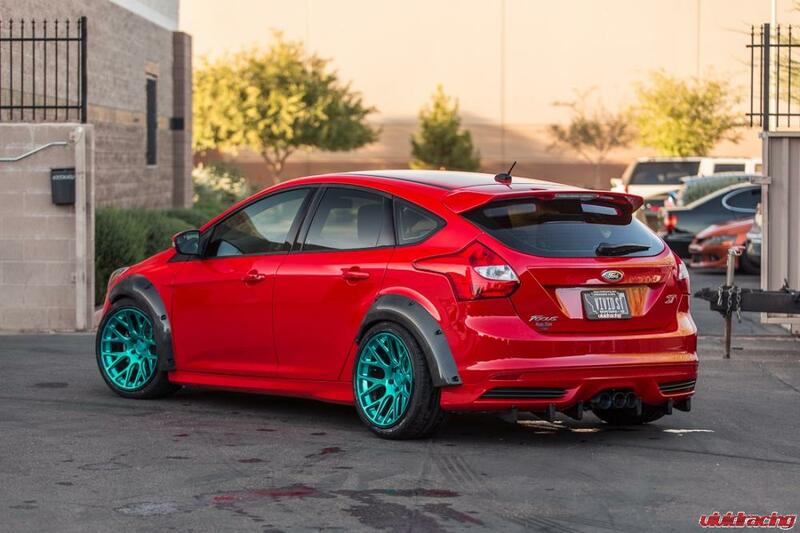 The add on fender flares we built to accomondate our 19×10 +15mm Niche wheels with 265/35/19 Falken tires and our soon to be shot, Work Wheels Meister 18×10 +15mm wheels with Toyo 265/35/18 tires. 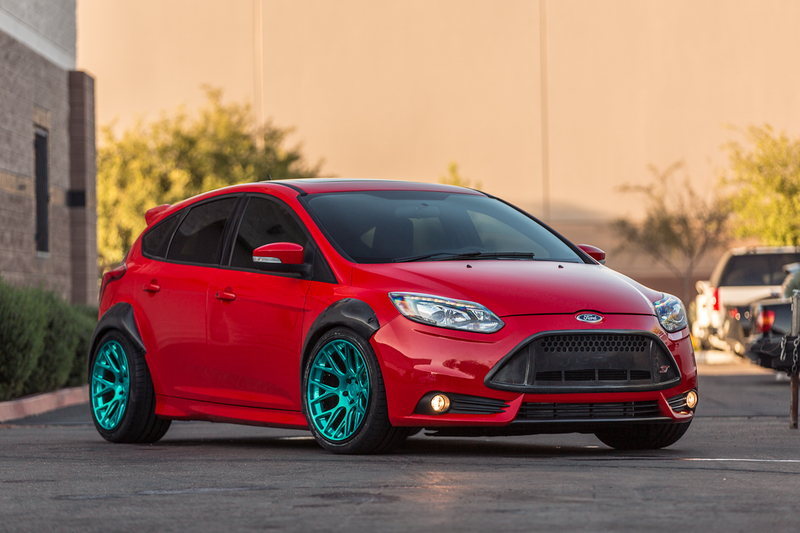 Even with the KW coilover suspension, the Focus ST needed “more low” to get that tucked look. So we modified the rear springs and to avoid any rubbing (which there would have been), we trimmed the rear fender arches. The front was able to be lowered with no issues and we did not need to trim the wheel wells. The rear features are carbon fiber strake diffuser and undertray. This rear component starts from the rear suspension arms and covers the entire bottom to where the fins fit on the back of the bumper lip. Because of how this product is made and not integrated into the lip, we would consider this a race part. The undertray with bracket supports fit nicely on the bottom of the car keeping airflow laminar and protecting that new exhaust system. Up front we have a complete replacement front grill. The factory honeycomb style front grill is actually non pourus in several spots blocking much needed airflow to the cars radiator and intercooler. The factory grill pops out from the back of the bumper when removed revealing an entire opening as a canvas. 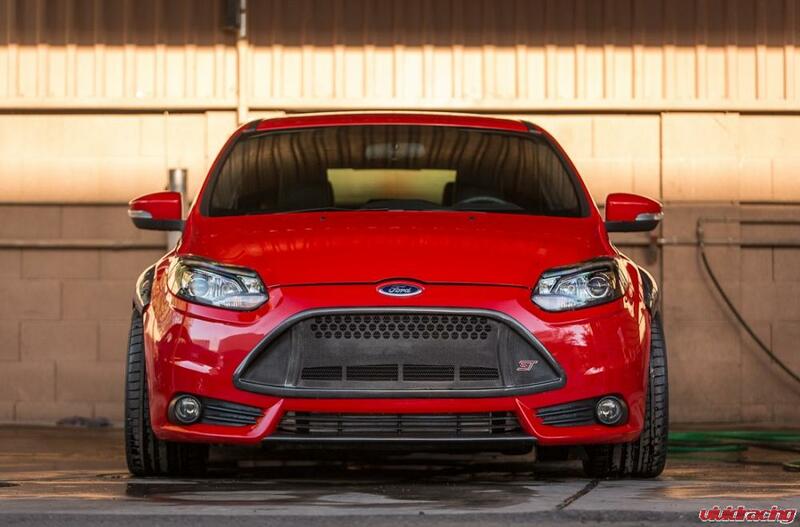 Instead of a steel mesh type insert like Grill Craft or other grill companies, we chose to make a front fit grill that gives the Focus ST a Steven Tyler mouth! The full carbon fiber grill features an outside beveled edge that can be siliconed or 3m taped in place using its molded edges. The grill is divided into 2 sections to still keep the front bumper beam hidden. The top features 3 rows of quarter size holes with a black mesh backing where the bottom has 4 rectangle openings to give more airflow to the Focus powerplant. In addition to the grill, we have created a small addon center lip to keep the front more rounded. This piece slides into place and uses the factory push clips to secure it on. Actually we are going to leave the carbon exposed. Using red diecut vinyl stickers I think we might sticker bomb them to see how it looks. 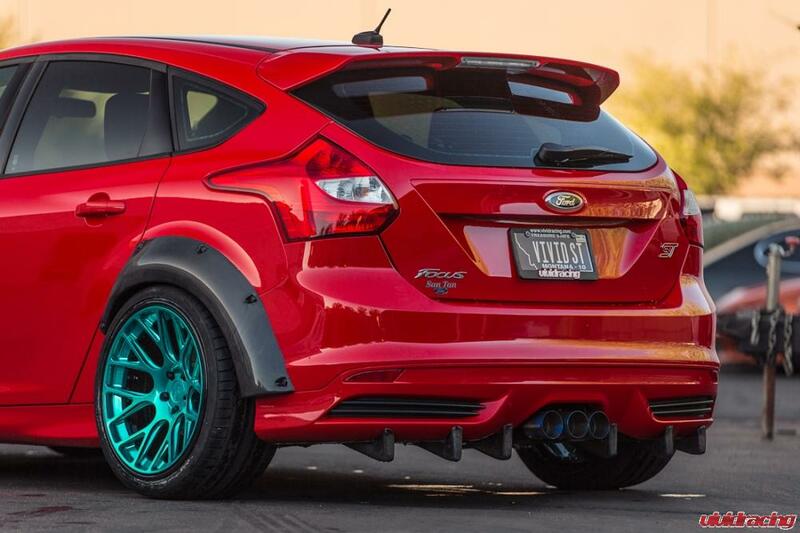 I like the black better with the falken logos on the tires. 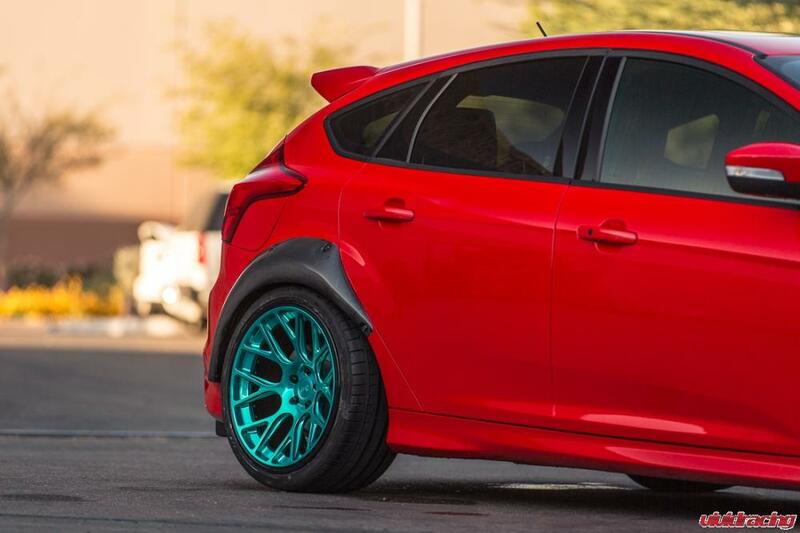 But I think that the falken should be white? I think it would look kind of cool! We agree, the white falken logo looks great. We’re going to see how we can make it happen for the final product. I would like to see a “rear seat delete” kit and then the rear doors could be done away with. Maybe even a replacement carbon panel where the door was. all that should save a couple of hundred pounds!! 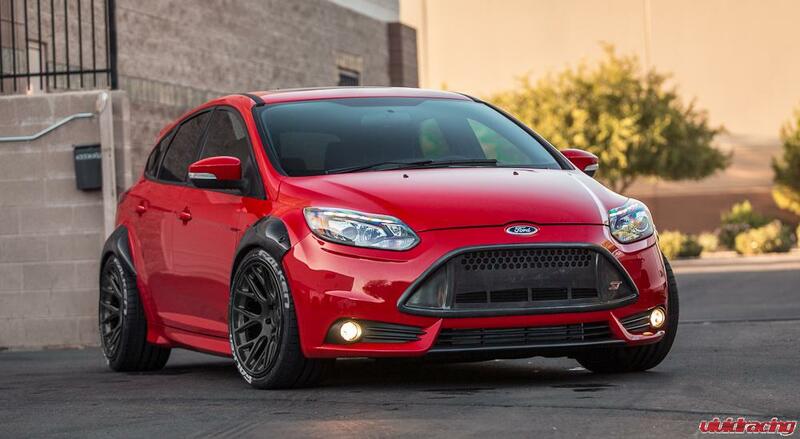 Currently, the ST is overweight; I would like to see it down close to 2500lbs which my modified 2003 SVT is. Seat delete is a cool idea. Though they dont weigh much. Are the over fenders being sold? How much? They are actually discontinued. However there has been a demand recently. We can make them in fiberglass but the price is $1000+ for the set of 4. If you are interested, email dan@vividracing.com.